Crystal Clear finish. Smooth, anti-smudge glass. Includes: Tempered Glass, Microfiber cloth, and Installation Kit. UNBEATABLE VALUE. iPhone 8 Cases. Phone Batteries. 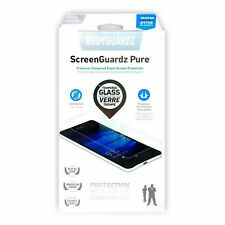 BodyGuardz PURE Screen Protector. For: HTC ONE A9. Tempered Glass. Crystal Clear and Ultra Thin. We are always willing to work things out. If we don't know about it, we can't fix it. Scratch Protection. Let's Get In Touch! Browse our. Tablets Accessories. Cell Phones Batteries. Cases & Covers. 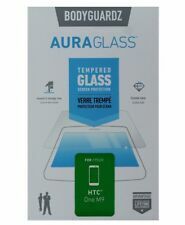 BodyGuardz products, The Aura Glass Tempered Glass Screen Protector for HTC One M9. Crystal Clear finish. Smooth and Smudge-free. Ultra-thin, looks and feels just like your device screen. Let's Get In Touch! The HD Impact screen protectors are also available in an anti-glare, smooth matte finish that is naturally resistant to fingerprints. Pure gives you the natural look and feel of your screen, with unbeatable impact and scratch protection. Also features smooth, anti-smudge, crystal clear glass. 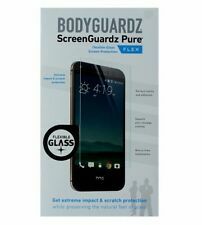 BodyGuardz Pure Glass Screen Protection for the NEW HTC ONE M8 Authentic! ScreenGuardz HD for HTC One (M8) reduces glare and makes it possible for you to use your device under bright lights and direct sunlight. Easy to apply and remove, the ultra-slim PET film overlays reduce glare and fingerprints while protecting your device’s screen from scratches. 5 out of 5 stars - BodyGuardz Pure Glass Screen Protection for the NEW HTC ONE M8 Authentic! 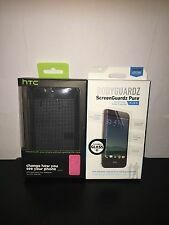 2 product ratings2 product ratings - BodyGuardz Pure Glass Screen Protection for the NEW HTC ONE M8 Authentic! 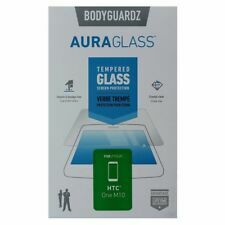 BodyGuardz Pure Tempered Glass Screen Protector for HTC One A9. 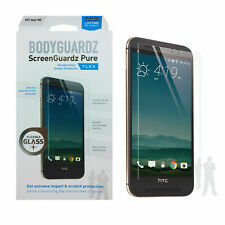 BodyGuardz ScreenGuardz Pure is the ultimate HTC One A9 screen protector. At BodyGuardz, we know not all HTC One A9 screen protectors are created equal. BodyGuardz products, The ScreenGuardz Pure Series Tempered Glass Screen for Samsung Galaxy S5 mini models. Clear transparent finish. - Pure gives you the natural look and feel of your screen with unbeatable protection. Made from a special chemically-tempered glass exceeding the hardness of steel, ScreenGuardz Pure Premium Glass Screen Protector sets the standard in protection. No matter what you're protecting, ScreenGuardz Pure is the clear choice. We know not all HTC One screen protectors are created equal. ScreenGuardz line is made from the best materials available, providing high-quality scratch protection at an affordable price. We are confident you wont find a better HTC One screen protector than BodyGuardz ScreenGuardz. Each overlay is custom designed to fit, protect, and enhance the performance of your device. And unlike many protectors that use residue leaving adhesives, ScreenGuardz HD protectors are designed to cling by themselves, ensuring you years of trouble-free, worry-free usage. This screen protector features a smudge-resistant coating to prevent fingerprints and anti-shatter glass for safety and premium optical clarity. Check-Out Later?. Software that has been opened will NOT be accepted.